Friday afternoons always feel full of possibilities. Especially when it’s a balmy 84 degrees outside and I finish work three whole hours earlier than expected, which is exactly what happened today. Having only gotten six hours of sleep after last night’s Prospect Park adventure and having chased after incredibly energetic small children all day, I was craving two things: the perfect cup of coffee and some uninterrupted reading time. So Simon and I decided to try a new coffee shop from our list. An Upper West Side coffee shop would have been the safest bet—we’ve had only the best experiences with lattes and pastries in this part of town. 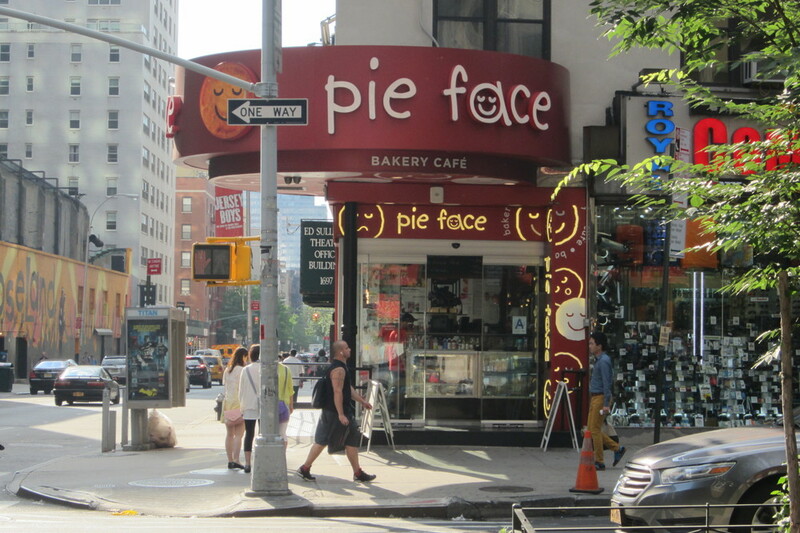 We were feeling rather exploratory though, so we looked at the Midtown section of our coffee map and settled on a café called Pie Face. Now we have a rule when it comes to trying new coffee shops—we do absolutely no research about where we are going beforehand—no checking out the menu online or reading someone else’s reviews. It helps each coffee shop experience retain an element of surprise, and it lets us form our own opinions about each place, unbiased by others’ perspectives. In the best of cases, following our rule has landed us in a coffee lover’s paradise, but there is always the risk that our experience will be a total bust. Pie Face was somewhere in between those two extremes. It turned out to be part of an Australian-owned café chain that specialized in miniature sweet and savory pies, which were quite literally decorated with faces to help distinguish one type from another. We placed our usual coffee order—a small latte for me, a macchiato for Simon—and after about 5 minutes of indecision, we settled on splitting three sweet pies: cheesecake, apple, and lemon cream. The pies were simply adorable, and they were everything I could have asked for as far as pies go. The apple pie tasted like Thanksgiving, the lemon cream tasted like summer, and the cheesecake was your classic New York cheesecake. Our latte and macchiato on the other hand left much to be desired…on a scale of 1 to 5, we rated them a 2. Watery and bitter—not the perfect cup of coffee I had craved. But now we have a new place to go to for pie, so it was a win on that account. We had also planned to read at Pie Face, but I wasn’t feeling particularly inspired by the cramped bar seating and the indie girl rock band music in the background. So we walked the seven blocks to Central Park and found the perfect reading spot: a little field populated by two hipster musicians, a group of 12-year-old rugby players who appeared to hail from Monaco, a father running after his twin toddlers who were frolicking across the grass hand in hand, and three petite white dogs chasing each other around in a dizzying and incredibly cute and entertaining fashion. I was so in love with our surroundings that I almost forgot I was there to read. I got distracted by people watching, and would have taken photos of everyone there if it had been socially acceptable. Since it wasn’t though, I eventually immersed myself into my current summer read, which I would recommend for anyone interested in a good coming of age story featuring a wildly insecure adolescent female protagonist, a comically dysfunctional family, and a nontraditional road trip across the American South. 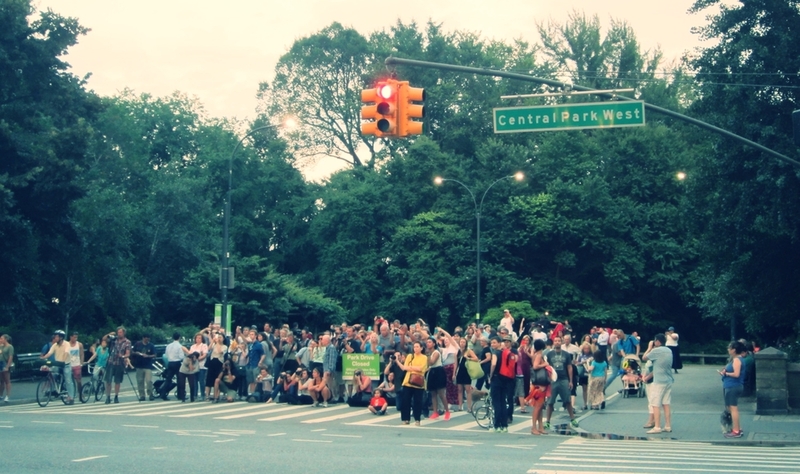 I leave you with this photo of a massive crowd of tourists taking a picture of the sunset at the same time. It was indeed a beautiful sunset, but how and why all of these people decided to photograph it together is beyond me. Ah, Manhattan.